Sure there are other commercial, high-quality computers that can perform like the 8080. But their prices are 5 times as high. 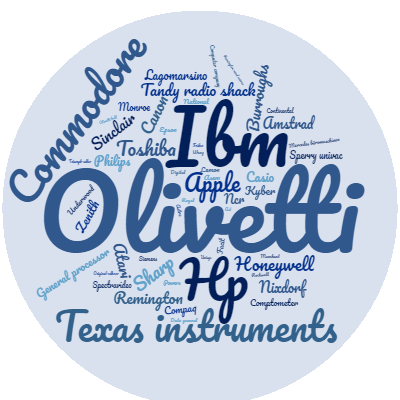 There is a rugged, reliable, industrial computer, with high commercial-type performance. 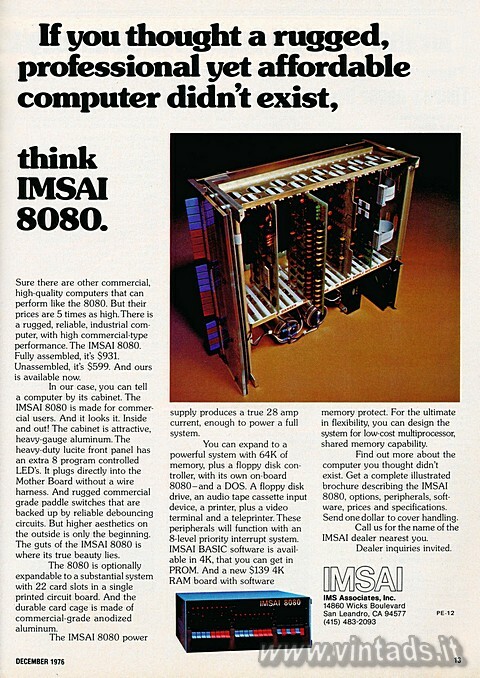 The IMSAI 8080. Fully assembled, it's $931. Unassembled, it's $599. And ours is available now. In our case, you can tell a computer by its cabinet. The IMSAI 8080 is made for commercial users. And it looks it. Inside and out! The cabinet is attractive, heavy-gauge aluminum. The heavy-duty lucite front panel has an extra 8 program controlled LED's. It plugs directly into the Mother Board without a wire harness. And rugged commercial grade paddle switches that are backed up by reliable debouncing circuits. But higher aesthetics on the outside is only the beginning. The guts of the IMSAI 8080 is where its true beauty lies. The 8080 is optionally expandable to a substantial system with 22 card slots in a single printed circuit board. And the durable card cage is made of commercial-grade anodized aluminum. The IMSAI 8080 power supply produces a true 28 amp current, enough to power a full system. You can expand to a powerful system with 64K of memory, plus a floppy disk controller, with its own on-board 8080—and a DOS. A floppy disk drive, an audio tape cassette input device, a printer, plus a video terminal and a teleprinter. These peripherals will function with an 8-level priority interrupt system. IMSAI BASIC software is available in 4K, that you can get in PROM. And a new $139 4K RAM board with software memory protect. For the ultimate in flexibility, you can design the system for low-cost multiprocessor, shared memory capability. Find out more about the computer you thought didn't exist. Get a complete illustrated brochure describing the IMSAI 8080, options, peripherals, software, prices and specifications. Send one dollar to cover handling. Call us for the name of the IMSAI dealer nearest you.